Born on the 8th September, 1887, in the illustrious family of Saga Appayya Diskhita and several other renowned saints and savants, Sri Swami Sivananda had a natural flair for a life devoted to the study and practice of Vedanta. Added to this was an inborn eagerness to serve all and an innate feeling of unity with all mankind. His passion for service drew him to the medical career; and soon he gravitated to where he thought that his service was most needed. Malaya claimed him. He had earlier been editing a Health Journal and wrote extensively on health problems. He discovered that people needed right knowledge most of all; dissemination of that knowledge he espoused as his own mission. It was divine dispensation and the blessing of God upon mankind that the doctor of body and mind renounced his career and took to a life of renunciation to qualify himself for ministering to the soul of man. He settled down at Rishikesh in 1924, practiced intense austerities and shone as a great Yogi, Saint, Sage and Jivanmukta. In 1932 he started the Sivanandashram. In 1936 was born The Divine Life Society. In 1948 the Yoga-Vedanta Forest Academy was organized. Dissemination of spiritual knowledge and training of people in Yoga and Vedanta were their aim and object. In 1950 he undertook a lightning tour of India and Ceylon. In 1953 he convened a 'World Parliament Reliogions'. He is the author of over 300 volumes and has disciples all over the world, belonging to all nationalities, religions and creeds. To read his works is to drink at the fountain of Wisdom Supreme. On 14th July, 1963 he entered Mahasamadhi. 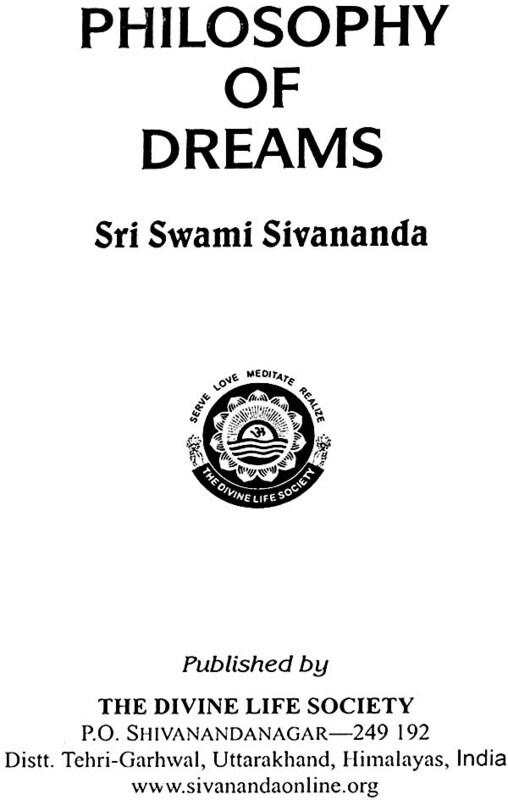 Though Sri Swami Sivanandaji Maharaj is an Advaita Vedantin of Sri Sankara's School, he is unique in that in his life and teachings he synthesizes the highest idealism and dynamic practical life. His "Divine Life" is ideal life, ideal and divine only because it is possible to live it here and now. The sage, therefore, has directed the beam of his divine light on all problems that face man. Not confining himself to the exposition of philosophy and Yoga, he has enriched our literature in other fields, too, e.g., medicine, health and hygiene and even "How to Become Rich." The analysis of dreams and their cause by psycho- analysts are defective. They maintain that the cause of dream creation lies in the suppressed desires of the dreamer. Can they create dreams as they like by sup- pressing desires? No, they cannot do that. They say that desires stimulate or help the dream creation. But they do not know what supplies the material out of which they are made and what turns the desires into actual expression, enabling the dreamer see his own suppressed de- sires materialised and appearing to him as real. The desires only supply the impulse. The mind creates the dream out of the materials supplied by the experiences of the waking state. The dream creatures spring up from the bed of Samskaras or impressions in the sub- conscious mind. Indigestion also causes dream. 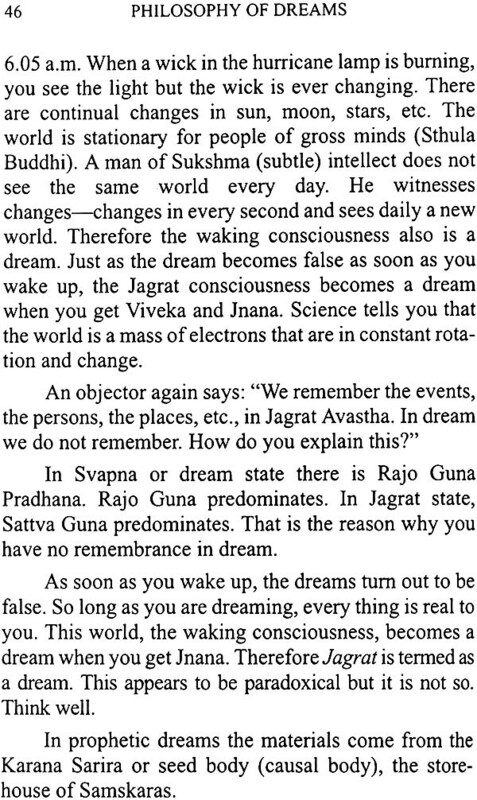 The Taijasa is the dreamer. It is the waking personality that creates the dream personality. The dream personality exists as the object of the waking personality and is real only as such. The waking and dreaming states do not exist independently side by side as real units. Why do we dream? Various answers have been given to this question. Dreams are nothing but a reflection of our waking experience in a new form. The medi disturbances somewhere in the body, but more particularly in the stomach. Sometimes coming diseases appear in dreams. According to Sigmund Freud all dreams without any exception are wish-fulfilment. The physical stimulus alone is not responsible for the production of dreams. The dream mechanism is very intricate. The wishes are of an immoral nature. They are revolting to the moral self, which exercises a control on their appearance. Therefore, the wishes appear in disguised forms to evade the moral censor. Very few dreams present the wishes as they really are. Dreams are partial gratification of the wishes. They relieve the mental tension and thus enable us to enjoy repose. They are safety valvesto strong impulsions. You will know your animal-self in dream. 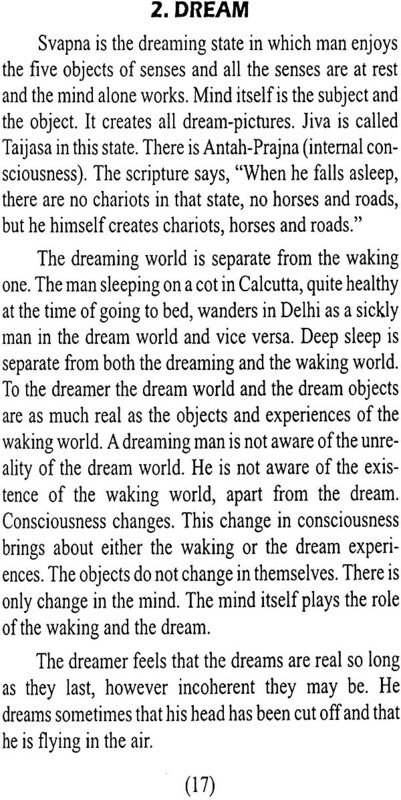 The objects which manifest during the dreaming state are often not different in many respects from those which one perceives during his waking state. During the dreaming state he talks with the members of his family and friends, eats the same food, behold rivers, mountains, motor cars, gardens, streets, ocean, temples, works in the office, answers question papers in the ex- amination hall, and fights and quarrels with some people. This shows that man does not abandon the results of his past relation with objects when he falls asleep. 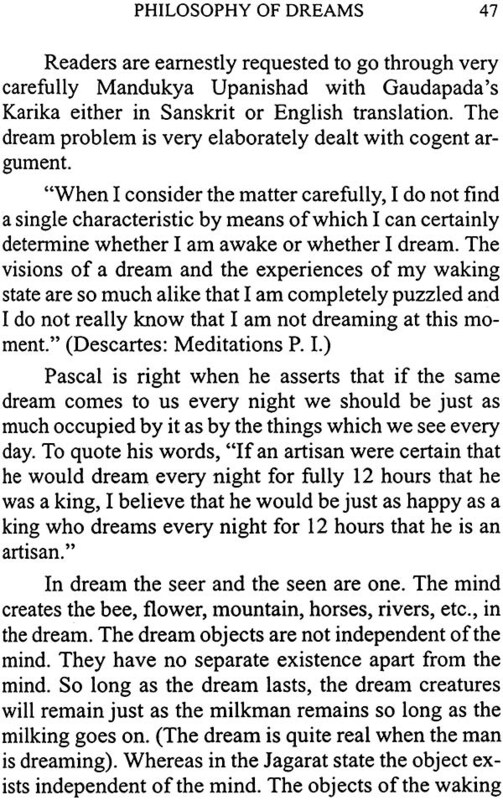 The objects which manifest during the dreaming state are often not different in many respects from those which one perceives during his waking state. During the dreaming state he talks with the members his family and friends, eats the same food, behold rivers, mountains friends, eats the same food, behold rivers, mountains, motor cars, gardens, streets, ocean, temples, works in the office, answers question papers in the examination hall, and fights and quarrels with some people. This shows that amn does not abandon the results of his past relation with objects when he falls asleep. The person who experiences the three states, viz., Jagrat or waking state, Svapna or the dreaming state, and Sushupti or deep-sleep state is called Visva in the waking state, Taijasa in the dreaming state and Prajna in the deep sleep state. When one gets up from sleep, it is Visva who remembers the experience of Prajna in deep sleep and says, “I slept soundly. I do not know anything” Otherwise remembrance of the enjoyment in deep sleep is not possible. The reactions to dreams differ according to mental disposition, temperament and diet of the person. All dreams are affairs of mere seconds. Within ten seconds you will experience dreams wherein the events of several years happen. Some get dreams occasionally, while some others experience dreams daily. They can never have sleep without dreams. The sun is the source and the temporary resting place of its rays. The rays emanate from the sun and spread in all directions at the time of sunrise. They enter into the sun at sunset, lose themselves there and come out again at the next sunrise. Even so the state of wakefulness and dream come out from the state of deep sleep and re-enter it and lose themselves there to follow the same course again. Whatever appears in the dream world is the reproduction of the waking world. It is not only the reproduction of the objects seen, experienced or dealt with in the present life, but it may be the reproduction of objection of objects seen, experienced or dealt with in any former life in the present world. Therefore the dream world cannot be said to be independent of the waking world. The objects that are seen in the state of wakefulness are always seen outside the body. It is, therefore, external to the dreamer, while the dream world is always internal to the dreamer. That is the only difference between them. During the dream state the whole wakeful world loses itself in the dream state. Therefore, it is not possible to find the dream state. Therefore, it is not possible to find the distinctive features that would help the dreamer to distinguish the waking world from the dream world. Scientists and Western philosophers draw their conclusions from the observations of their waking experience. Whereas the Vedantins utilise the experiences of the three states, viz., waking, dream and deep and then draw their conclusions. Hence the latter’s conclusions are true, correct, perfect full integral, while those of the former are partial and sided. Certain kinds of external sounds such as the ringing of a bell, the noise of alarm-clock, knocks on the door or the wall, the blowing of wind, the drizzling of rain, the rustling of leaves, the blowing of the horn of a motor car, the craking of the window, etc., may produce in the mind of the dreamer variety of imaginations. They generate certain sensations, which increase according to the power of imagination of the sleeper and the sensitiveness of his mind. These sounds cause very elaborate dreams. If you touch the dreamers’ chest with the point of a pin, he may dream that some one has given him a severe blow on his or stabbed him with a dagger . The individual soul does not know that he is dreaming during his dream state and is not conscious of himself as he is bound by the Gunas of Prakriti. He passively beholds the creations of his dream mind passing before him as an effect of the workings of the impressions (Samskaras) of his waking state. It is possible for a dreamer to remain cognisant during his dream state of the fact that he is dreaming. Learn to be the witness of your thoughts in the waking state. You can conscious in the dream state that you are dreaming. You can alter, stop or create your own thoughts in the dream state independently. You will be able to keep awake in the dream state. If the thoughts of the waking state are controlled, you can also control the dream thoughts. Sometimes the dreams are very interesting and turn out to be true. They foretell events. A man living a Haridwar dreamt on the first January 1947 that he will be in Benares on the night of the third January. It really turned out to be true. An officer dreams that he will be transferred to Allahabad. In the following he gets the transfer order. Another man dreams that he will meet with a motor car accident on the coming Saturday. It also turns out to be true. Profound wisdom comes through reflection on dreams. No one has known himself truly who has not studied his dreams. The study of dreams shows how mysterious is our soul. Dreams reveal us that aspect of our nature, which transcends rational knowledge. Every dream presentation has a meaning. A dream is like a letter written in an unknown language. Many riddles of life are solved through hints from dreams. Dreams indicate which way the spiritual life of a man is flowing. One may receive proper advice for self-correction through dreams. One may know how to act in a particular situation through dreams. The dreams point out a path unknown to the waking consciousness. Saints and sages appear in dreams during times of difficulty and point out the way. 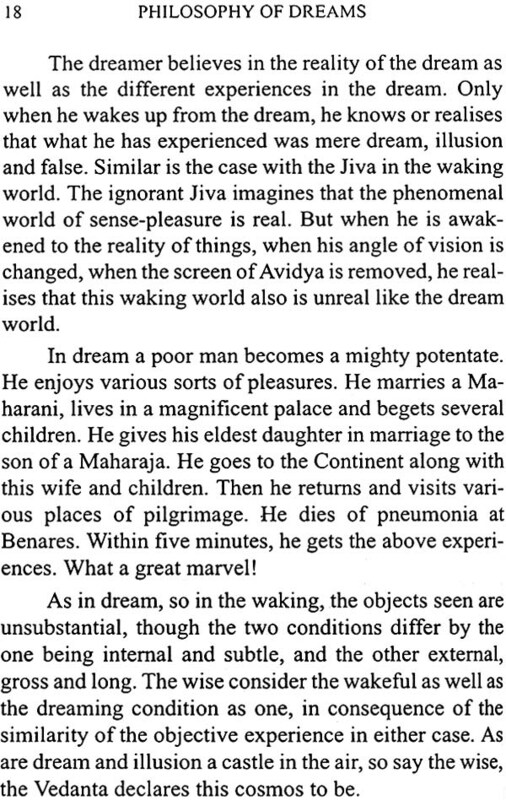 The Vedantins study very deeply and carefully the states of dreams and deep sleep and logically prove that the waking state is as unreal as the dream state. They declare that the only difference between the two states is that the waking state is a long dream, Deergha Svapna. So long as the dreamer dreams, dream-objects are real. When he wakes up the dream world becomes false. When one attains illumination or knowledge of Brah-man, this wakeful world becomes as unreal as the dream world. The real truth is that nobody sleeps, dreams or wakes up, because there is no reality in these states. Transcend the three states and rest in the fourth state of Turiya, the eternal bliss of Brahman, Satchidananda Svaroopa.